I’m not surprised this CD has received a nomination as “Recording of the Year” from the Cajun French Music Association. It’s impossible not to move, while hearing these songs! It’s all played and sung so beautiful, with so many feeling! Traditional Cajun music from heart to heart! Iry LeJeune was born on October 28, 1928, in Pointe Noir (near Church Point), Louisiana. Nearly blind from birth and unable to help with farm work, as a child he spent his days at the home of his uncle, Angelas LeJeune, a popular Cajun musician of the 1920's. 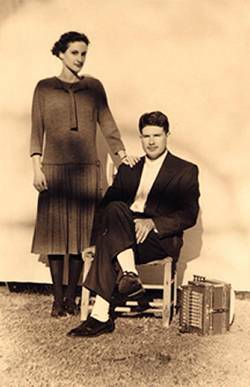 During the 1930's the accordion lost its popularity for the fiddle; but Iry LeJeune is regarded as the man responsible for the revival of the Cajun accordion after World War II. Iry first recorded "Lovebridge Waltz" for the Opera record company in Houston. Next to a brilliant accordionist, he was also a great singer-songwriter. His popularity grew with the release of records such as "Lacassine Special," "J'ai Eté Au Bal" and "Calcasieu Waltz" on Eddie Shuler's Goldband records. On the night of October 8, 1955 (49 years ago, today! ), Iry LeJeune and fiddler J.B. Fuselier were returning home from a dance in Eunice when their car developed a flat tire. As they changed the tire at the side of the road a passing car struck them. Fuselier was seriously injured; LeJeune was thrown into a nearby field and killed instantly. He was not yet 27 years old. 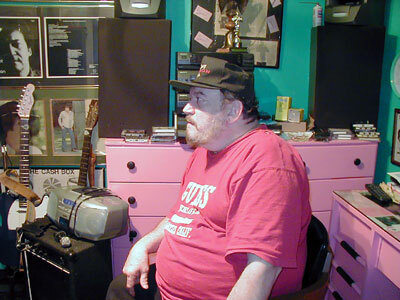 Iry LeJeune is one of the most important musicians in the history of Cajun music. He was also father from another legendary accordion player-singer, Eddie LeJeune, who left us a few years ago. Today it's Chuck's birthday! Besides being a great guitar player, Chuck is also the porter to this Cajun Corner. Or have you ever entered this site without passing by Chuck's Hot News page? What else has this guy to do with Cajun music? 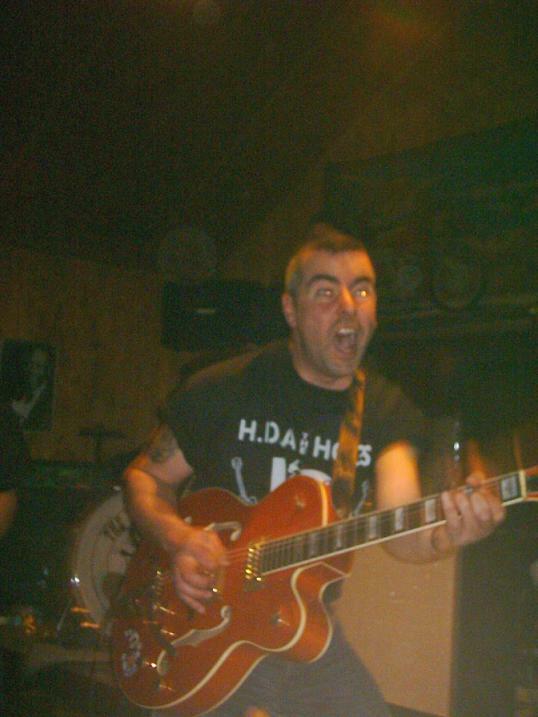 Well, who else do you think plays the guitar with the Billygoat Riders on songs like "Lache Pas La Patate", "The Back Door", "Jambalaya-Grand Texas", "One Step A Chaumant", "High Point Two-Step"...? Bon anniversaire, Chuck! And all you Cajuns, have a good drink on him! Joe Barry has passed away. Last Tuesday, 31st August, Swamp Popper Joseph Barrios (a.k.a. Joe Barry) died at age 65. Joe began recording locally in 1958, but his version of "I'm A Fool To Care" (a ballad from Gene Autrey) put him in the national spotlight in the early sixties and became a gold record. His last album "Been Down That Muddy Road" for Night Train Records, was released August 19, 2003. About a month ago he suffered a heart attack. Hi waitress! May I have la carte please? Of course sir, do you want to eat or to drink in here? Mais non, madame! I just can't find my way home back to Mamou. 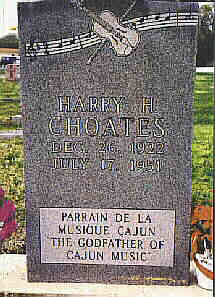 The fiddle king of Cajun swing, Harry Choates died in jail on July 17, 1951. Officially he died from beating his head against the cell bars, while he was in need of alcohol, but possibly his jailers may have killed him while attempting to calm him. Harry Choates, born at the end of 1922, played at young age with Leo Soileau and Happy Fats “LeBlanc”. Next to fiddle, Harry also played accordion, guitar and steel guitar. Around 1946 he started a band, called the Melody Boys. That year he also recorded “Jole Blon” (an old Cajun waltz) for the Gold Star label. It was a big success (one year before piano player Moon Mullican recorded the song), but because Harry suffered from chronic alcoholism, he sold "Jole Blon" for $100 and a bottle of whiskey. Harry Choates, who became famous for his "Eh...ha, ha!" and "aaiee" vocal cries, mixed traditional Cajun music with Western Swing. 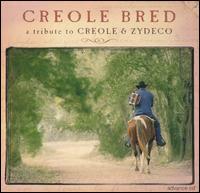 After the surprising cd "Evangeline Made", which includes non-Cajun artists playing & singing Cajun, Vanguard Records now came out with a tribute to Creole & Zydeco. This cd is also produced by that busy cajun woman, Ann Savoy. Zydeco star, Geno Delafose & cajun fiddler Michael Doucet also gave their contribution. Next to Creole fiddler-accordion player Ed Poullard (who also played with Beausoleil & the Ardoin Family Band), here with Darol Anger and next to the well-known zydeco's Nathan Williams & the Zydeco Cha-Chas and Keith Frank (with Rosie Ledet, Sean Ardoin and Nathan Williams & his Cha-Chas), this cd includes well known outsiders such as Los Lobos' David Hidalgo, Michelle Shocked, Taj Mahal and even "Wordy Rapping Hood" Tom Tom Club and Cyndi Lauper... But as soon as you overcome this shock, you can have a listen to this cd, 'cause they really did a very good job! Also check Patje's review on "cd-reviews" (on Billybop). Hackberry Ramblers: "Early Recordings: 1935-1950"
Arhoolie Records made a compilation from the historic first recordings of the Hackberry Ramblers on cd. It's absolutely a must for all cajun- and western swing- lovers. Those years, this legendary band played even more Western Swing than Cajun. 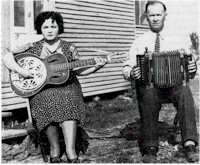 But the typical bayou-sound, and also the hillbilly and old-time influences, has always been present! Great fiddle sound by Luderine Darbone, who's still performing with accordionist Edwin Duhon and the other Hackberry Ramblers! Next to Luderine Darbone, the Hackberry Ramblers also included musicians such as Lennis Sonnier, "Rang Tang Bully" Joe Werner, Floyd & Lonnie Rainwater, Pete Duhon, Danny & Floyd Shreve, Johnny Puderer, etc. Exactly 12 years ago, 17th June 1992, cajun legend Dewey Balfa died. Dewey was born, as son of Charles Balfa and Amay Ardoin, in 1927 in Grand Louis (near Mamou), Louisiana. His father, grandfather , great-grandfather and his brother Will, were also fiddlers. 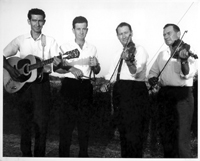 At a young age, Dewey started the Balfa Brothers, with Will (also on fiddle), Harry and later Rodney on guitar. They became famous for their compelling twin fiddle sound and soulful vocals. They added an accordion by great players such as Nathan Abshire, Hadley Fontenot, Nonc Allie Young and Marc Savoy. Dewey also worked as a farmer, insurance salesman, schoolbus driver, deejay and furniture storeowner. In 1964 he performed (with Gladius Thibodeaux and Louis LeJeune) at the Newport Folk festival in Rhode Island. About 17.000 people (most of them never heard about cajun music before) gave the band a standing ovation. In 1978, his Balfa brothers Rodney and Will died in a tragic car accident. Dewey started playing with Tony (Rodney's son) and some other musicians. In 1982 Dewey received the National Endowment for the Arts' National Heritage Fellowship, the highest honor this country can bestow on a traditional artist. Today the Balfa tradition is still carried on by Balfa Toujours, with Christine Balfa (Dewey's youngest daughter).